Nora Besansky, O’Hara Professor of Biological Sciences at the University of Notre Dame and a member of the University’s Eck Institute for Global Health, has led an international team of scientists in sequencing the genomes of 16 Anopheles mosquito species from around the world. Anopheles mosquitoes are responsible for transmitting human malaria parasites that cause an estimated 200 million cases and more than 600 thousand deaths each year. However, of the almost 500 different Anopheles species, only a few dozen can carry the parasite and only a handful of species are responsible for the vast majority of transmissions. Besansky and her fellow researchers investigated the genetic differences between the deadly parasite-transmitting species and their harmless (but still annoying) cousins. Two papers published in today’s (Nov. 27) editions of Science Express, an electronic publication of selected papers of the prestigious journal Science in advance of print, describe detailed genomic comparisons of these mosquitoes and the deadliest of them all, Anopheles gambiae. These results offer new insights into how these species are related to each other and how the dynamic evolution of their genomes may contribute to their flexibility to adapt to new environments and to seek out human blood. These newly sequenced genomes represent a substantial contribution to the scientific resources that will advance our understanding of the diverse biological characteristics of mosquitoes, and help to eliminate diseases that have a major impact on global public health. Malaria parasites are transmitted to humans by only a few dozen of the many hundreds of species of Anopheles mosquitoes, and of these, only a handful are highly efficient disease-vectors. Thus, although about half the world’s human population is at risk of malaria, most fatalities occur in sub-Saharan Africa, home of the major vector species, Anopheles gambiae. Variation in the ability of different Anopheles species to transmit malaria – known as “vectorial capacity” – are determined by many factors, including feeding and breeding preferences, as well as their immune responses to infections. 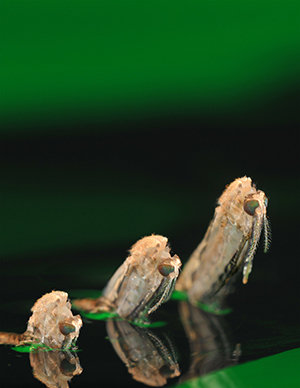 Much of our understanding of many such processes derives from the sequencing of the Anopheles gambiae genome in 2002, which was led by Notre Dame researchers and which has since facilitated many large-scale functional studies that have offered numerous insights into how this mosquito became highly specialized in order to live amongst and feed upon humans. Until now, the lack of such genomic resources for other Anopheles limited comparisons to small-scale studies of individual genes with no genome-wide data to investigate key attributes that impact the mosquito’s ability to transmit parasites. To address these questions, researchers sequenced the genomes of 16 Anopheles species. “We selected species from Africa, Asia, Europe and Latin America that represent a range of evolutionary distances from Anopheles gambiae, a variety of ecological conditions, and varying degrees of vectorial capacity,” Besansky said. DNA sequencing and assembly efforts at the Broad Institute were funded by NHGRI and led by Daniel Neafsey, with samples obtained from mosquito colonies maintained through BEI Resources at the United States Centers for Disease Control and Prevention, and wild-caught or laboratory-reared mosquitoes from scientists in Africa, India, Iran, Melanesia and Southeast Asia. “Getting enough high-quality DNA samples for all species was a challenging process and we had to design and apply novel strategies to overcome the difficulties associated with high levels of DNA sequence variations, especially from the wild-caught sample,” Neafsey said. With genome sequencing complete, scientists from around the world contributed their expertise to examine genes involved in different aspects of mosquito biology including reproductive processes, immune responses, insecticide resistance, and chemosensory mechanisms. These detailed studies involving so many species were facilitated by large-scale computational evolutionary genomic analyses led by Robert Waterhouse from the University of Geneva Medical School and the Swiss Institute of Bioinformatics. The researchers carried out interspecies gene comparisons with the Anopheles and other insects, to identify equivalent genes in each species and highlight potentially important differences. “We used similarities to genes from Anopheles gambiae and other well-studied organisms such as the fruit fly to learn about the possible functions of the thousands of new genes found in each of the Anopheles genomes,” Waterhouse said. Examining gene evolution across the Anopheles revealed high rates of gene gain and loss, about five times higher than in fruit flies. Some genes, such as those involved in reproduction or those that encode proteins secreted into the mosquito saliva, have very high rates of sequence evolution and are only found in subsets of the most closely-related species. The newly available genome sequences also provided conclusive evidence of the true relations amongst several species that are very closely related to Anopheles gambiae but nevertheless show quite different traits that affect their vectorial capacity. This study substantially improves our understanding of the process of gene flow between closely related species – a process believed to have occurred from Neanderthals to the ancestors of modern humans – and how it may affect the evolution of common and distinct biological characteristics of mosquitoes such as ecological flexibility and vectorial capacity. These two very different evolutionary timescales – spanning all the Anopheles or focusing on the subset of very closely-related species – offer distinct insights into the processes that have molded these mosquito genomes into their present-day forms. Their dynamic evolutionary profiles may represent the genomic signatures of an inherent evolvability that has allowed Anopheles mosquitoes to quickly exploit new human-generated habitats and become the greatest scourge of humankind. Besansky’s research focuses primarily on African vectors of human malaria: the anopheline mosquitoes known as Anopheles gambiae and Anopheles funestus. The Eck Institute for Global Health is a University-wide enterprise that recognizes health as a fundamental human right and endeavors to promote research, training and service to advance health standards for all people, especially people in low- and middle-income countries who are disproportionately impacted by preventable diseases. Originally published by William G. Gilroy at news.nd.edu on November 27, 2014.